TECHNOLOGY — Slacking. Wasting time. Definitely not being productive. Those thoughts come to mind when watching people sitting on the couch playing video games. Michael and Brodie Stanfield don’t fit that mold; playing video games launched the father and son on a seven-year creative process. They’re co-founders of Oshawa-based IFTech and creators of a piece of technology they hope will reach across industries. They were playing a video game when they were inspired to design a multi-sensory feedback suit aimed at taking users as far into the experience of gaming as possible. 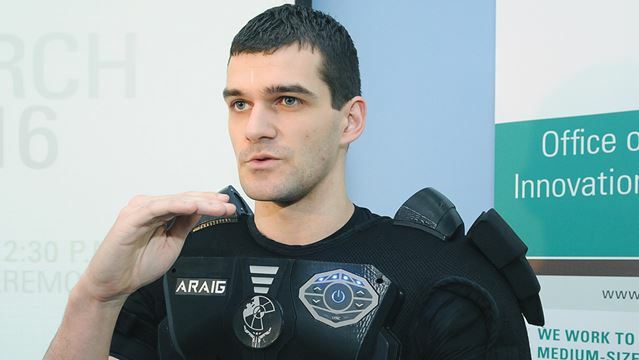 The As Real As It Gets suit, or ARAIG, makes simulated experiences as realistic as possible, though it looks like something out of a sci-fi movie. No matter how it looks, it’s real and, according to the Stanfields, it works. Utilizing vibration, muscle stimulation and strategically placed speakers, ARAIG is meant to offer more than the one-way experience gamers currently experience from video games. Brodie cites the example of someone playing as a first-person shooter. The first thing a person wearing the ARAIG suit would notice in a battlefield scenario is how all-encompassing the sound is, as if a battle was raging around him. Each hit from enemy fire would send vibrations through the player’s body where the impact registered. Firing back at the enemy would see the suit simulating kickback, by either stimulating or contracting the player’s muscles. The feel of the game wouldn’t end at shooting; if a tank rolled by, the experience would be jarring, says Brodie, just like it would feel in the real world.